Ground-penetrating radar (GPR) gives towns and cities another tool they can use to more precisely target such digs. 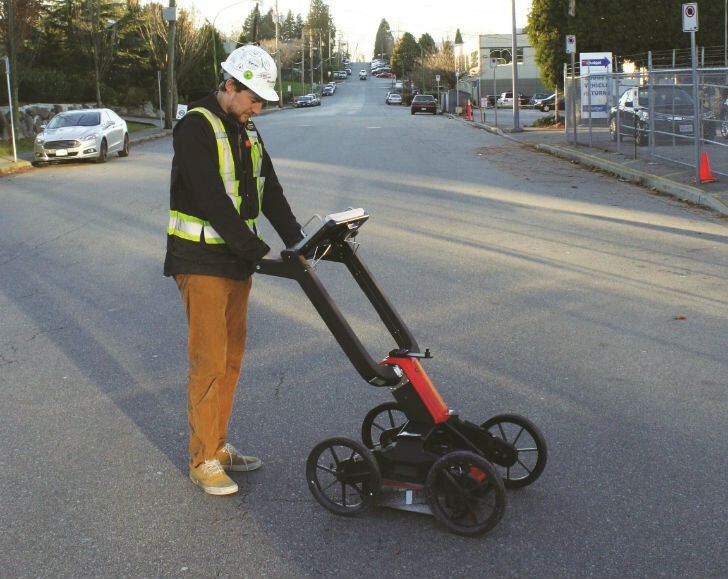 That’s been the case in North Vancouver, a district that’s used GPR to map subsurface voids, which can lead to pavement breaks, like potholes or even damaging sinkholes. Traditionally, answering such questions would mean cutting open a street or intersection, along with the attendant traffic disruptions and costs. But GPR gives towns and cities another tool they can use to more precisely target such digs, or maybe even decide they’re not necessary at all. One example of a company offering GPR is GeoScan, Inc., a nine-person B.C.- based firm founded in 2010. Owner Will Meredith says his clients are showing more interest in using GPR as a void-locating tool: “We’ve done these jobs sporadically over the past few years, but we’ve done quite a few in the past few months, so we’re starting to focus more on them,” he says. The company’s main pieces of equipment include ground-penetrating radar with frequencies ranging from 100 MHz to 2300 MHz. (The lower frequencies penetrate deeper into the ground but don’t return as clear of a picture.) For void detection, Geo- Scan uses a Mala 450 MHz single-frequency ground-penetrating radar antenna. When the initial survey is complete, the company uses specialized software to create amplitude maps, showing peak amplitudes and negative amplitudes over the target area. It can then plot that data and present it to the client using CAD software or Google Earth. Voids present a different challenge than searching for utilities, however. Subsurface voids aren’t the only area beyond utilities where GeoScan is applying its GPR technology. Other applications range from locating underground oil tanks to archaeology and even grave locating, in situations where tombstones have either sunk or gone missing. GeoScan uses specialized software to create amplitude maps, showing peak amplitudes and negative amplitudes over the target area. Klochnyk, for his part, sees GPR as a tool that can make sense for detecting subsurface voids. However, he feels it’s best applied under specific circumstances, such as when a physical inspection has turned up signs of a potentially wider issue and not as a first-strike tool on its own. Instead, he sees the technology as best used in tandem with existing historical data, particularly in a municipality like North Vancouver, which has numerous underground water systems.